These spots are a quick drive, and they offer everything that you need to get started. I haven't skied at either of them, so if you have, please let us know what you thought. + Pine Ridge Cross County Ski Area, located in Rensselaer County (in Poestenkill), is open daily and offers trails, rentals, lessons, and a retail shop. Their first time skier package, including trail access, equipment rental, and a lesson, costs $38/adult, $34/youth 13-18, and $25/child 12 and under. For more information, check the link or call 283-3652. + Tree Haven Trails, located at Bob's Trees just west of Saratoga County in Hagaman, is open daily and offers trails, rentals, and lessons. Trail access and equipment rental together cost $17/adult and $11/child under 12. Group lessons cost $14/person. There's also a maximum family price that kicks in if you've got at least 5 people. For more information, check the link or call 882-9455. If you're not ready to commit to purchasing a shiny new pair of skis, here are some additional rental or used options available nearby. + Goldstock's Sporting Goods has a limited number of cross country skis available for rent at $20/day. + Freeman's Bridge Sports rents skis for $20/day or $30/Friday to Monday. 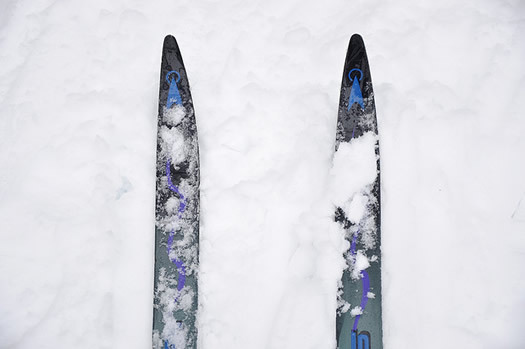 + Eastern Mountain Sports rents cross country skis for $15 to $20 per day. + Play it Again Sports doesn't rent skis, but if you're lucky (very lucky: selection is limited), you could find some used skis and boots for as little as $50-$70. If you're a brand-new skier, it's easiest to start out somewhere that's either been groomed for skiing or has been skied before so that you can literally follow in someone else's tracks. A fairly level course is a good idea as well. If you don't take a lesson, try taking a friend with some experience. These are great destinations. Just keep in mind that hills that you've hiked can seem larger and more daunting (or more fun!) on skis. Rich from No Rocking Chair for Me frequently reports on conditions along local cross country and nature trails. Silvia at DelSo just shared her favorite cross country destination. Try not to mess it up for her. Once you're ready to venture farther afield, check out this site for more cross country ski areas. Albany Kid also posted information about cross country skiing places that aren't too far away. Some of you may recall those halcyon days when you could rent cross country skis at Saratoga Spa State Park or the Colonie Golf Course. Alas, neither rent skis anymore. These days, the Colonie folks have moved any trail grooming from the golf course to the Crossings, and that's only when they manage to catch up with all of the street plowing (in other words, not yet this season). Finally, folks who commented on the recent snowshoe post had great suggestions that work for cross country skiing, too. Wear layers and bring a backpack to carry extra clothes, and bring along a nice thermos of something warm and a snack. Thanks to everyone who passed along information. Oh, and a cell phone's a good idea, too. Not that you'll need it. But, you know: just in case. Katie, thanks fro mentioning my blog. Hope somebody finds it useful! Pine Ridge- my husband and I had our first cross country skiing experience there, and enjoyed it so much we went back several times over the course of two winters and ultimately bought our own skis. For Guilderland residents, Western Turnpike golf course has groomed trails and they're going to be renting out skis starting in February. We also see people cross country skiing at Tawasentha park often when we go there to snowshoe. The park trails aren't groomed, though.